Rather than a memorial table at our wedding, we opted to create a gallery wall using wedding photos from family members of generations past. Since my family is a lot bigger than his, this was a way to honor our loved ones without making it seem disproportionately skewed in my family’s favor. I added in several other pieces, all of which were made with the help of the Cricut. There was a mega coupon on bulk canvases from Joann, so a pack of 12×12 and 8×10 ended up running me something like $6 each. I love that place. 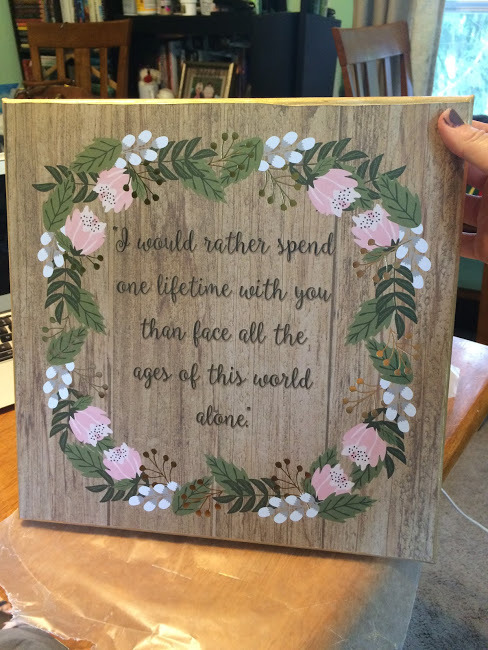 For this one, I took a pre-printed sheet of scrapbook paper and had the Cricut write the quote once in gold and once in black for that shadow effect. I used spray adhesive to mount it on the canvas and painted the edges gold. 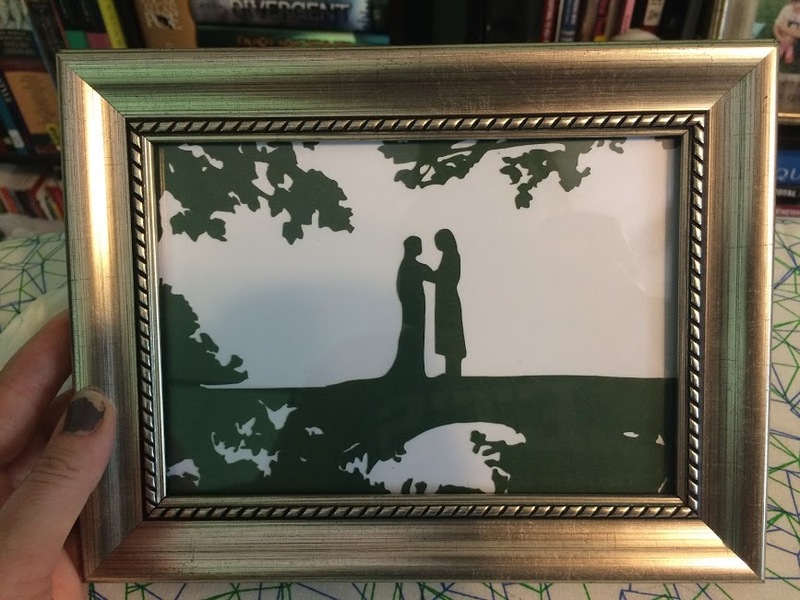 I also made a few pieces by uploading images into the Cricut design space, blowing out the resolution, and deleting the background. I then glued the cut-out pieces to 5×7 slices of paper that were then stuck in frames I borrowed from myself. 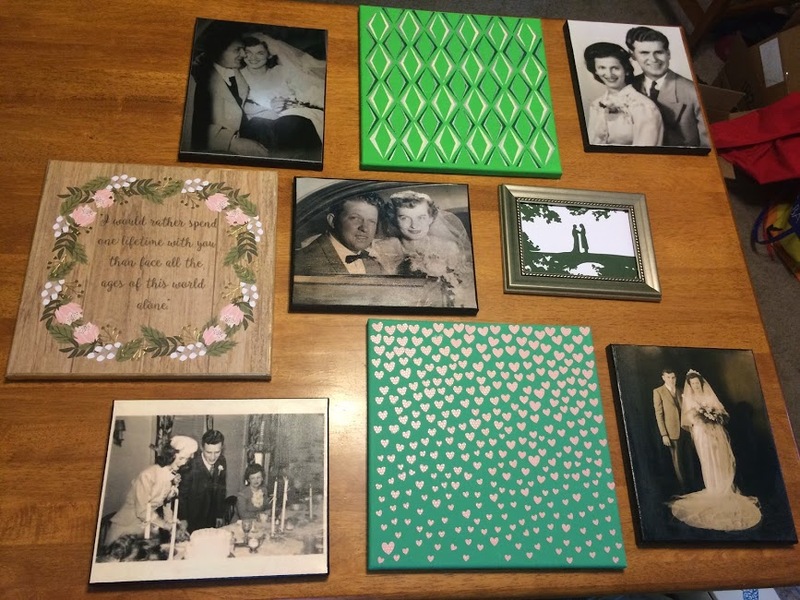 Many of the 12″x12″ canvases were painted and decorated with a bunch of hearts, some leaves, and other such whimsical shapes that I’d cut out on the Cricut and attached with spray adhesive. For the portraits, I ordered 8×10 prints from Walmart and mounted them to canvas using designertrapped’s tutorial, though I found that muslin scraps made a better texture than pressing another canvas on top of the Mod Podge. I also discovered that actual photo prints work much better than prints from either an inkjet or laser printer. Up close, you can tell that they’re not professionally made, but they looked good enough to make several people cry, so I’m counting that as a win. Unfortunately, I don’t have a photo of the finished product (I may have been a bit distracted), but the pieces were hung along the entry way to the reception hall. Once I’d figured out the process, the photo canvases were relatively quick to do, save drying time between steps. The other art was really as intricate as I wanted it to be: the pieces in the photo were done early on, but as the wedding approached, I was just slapping a paper fern onto a canvas and calling it good. I’m confident no one noticed, and the gallery wall ended up being an easy way to have custom decor at our wedding.